The Elder family has a large collection of parakeets, cockatiels, and a golden pheasant. They have a large cage that lines the back border of their property where the birds are on display for anyone who passes. The city trail, accessed from either Healey Park or Ridge Drive, will take you right past the birds. Bring along some corn chips to feed the birds if you like! 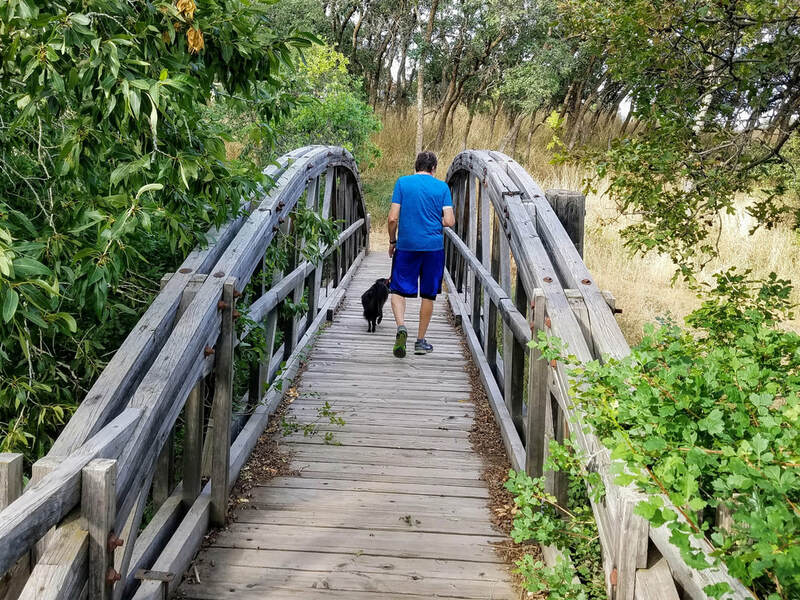 If you take the path from Cabin Springs Circle (off Ridge Road), you cross a very pretty bridge right before you come to the birds! Watching the birds is fun for all ages! Bringing corn chips to feed them is even more entertaining! 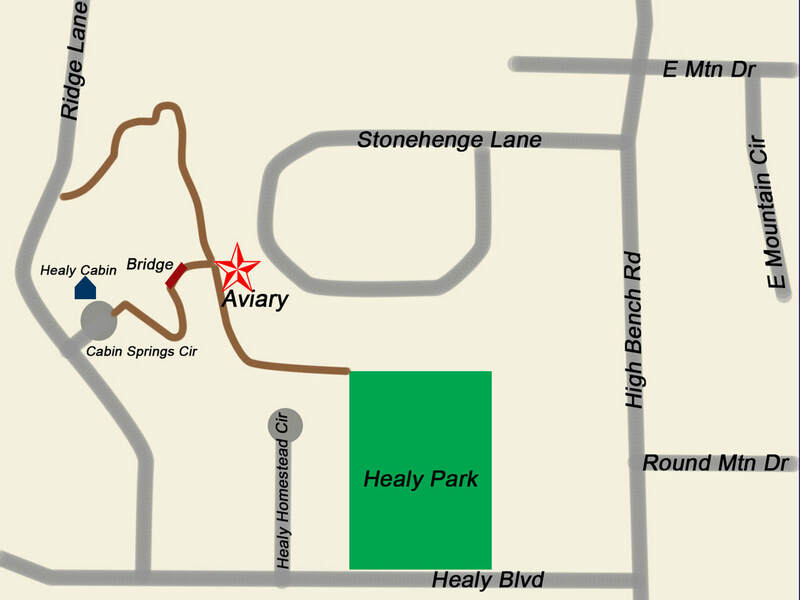 The birds are a short walk from Healey Park, or an equally short walk over the bridge via Cabin Springs Circle. You'll know you are close when you hear the birds chirping! It's as if they're excited to see you, too! 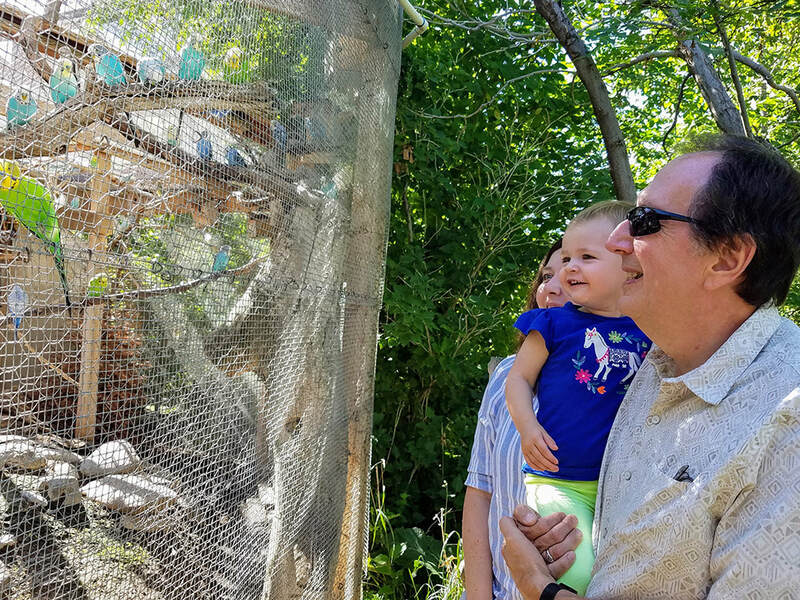 The aviary grew as a result of a School Senior Project requirement at Lone Peak HS. Cary Elder's son asked if they could build an aviary bordering the Alpine Community Walking Trail. The northern portion was the original aviary and has been present for more than 10-years. 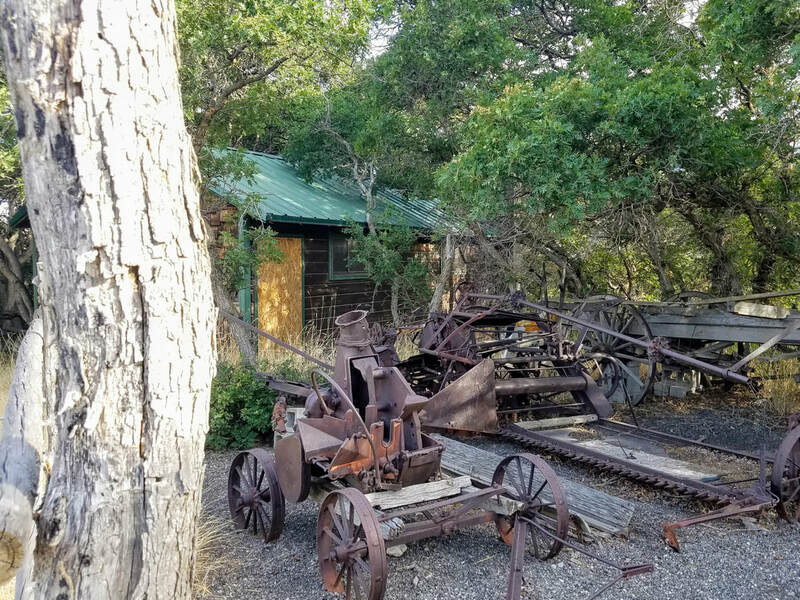 The original aviary has been home to several species of Pigeons, Dove’s, Pheasant’s and Quail, although natural aging has diminished the ground dwelling birds to as single Golden Pheasant. Because of the tendency of pheasants to be territorial, new species are only added collectively at the same time, meaning new varieties cannot be introduced until this pheasant (which is over seven-years old) passes on. At that time, a new collection that can be introduced and raised together. 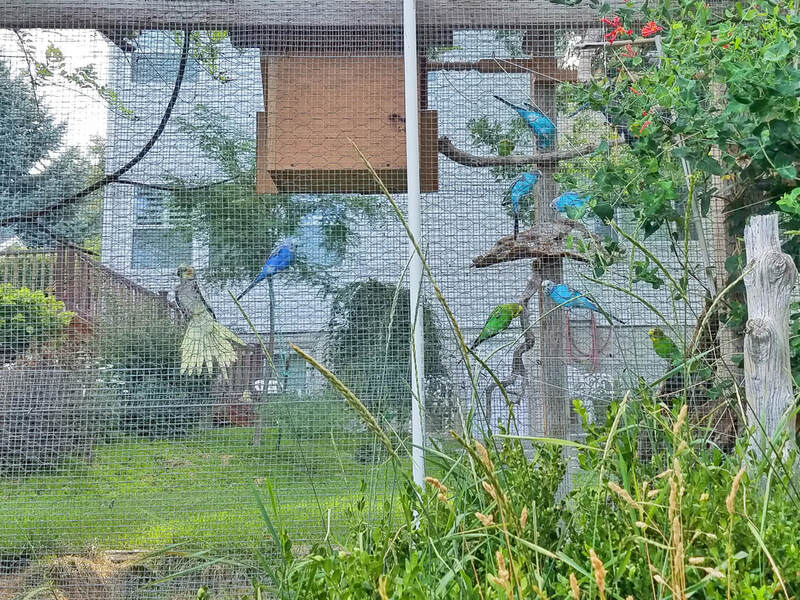 Several variety of hookbill’s, such as Parakeet’s, Cockatiel’s, Indian Ringneck Parakeet’s, Alexandrine Rose-Ringed Parakeet’s, Barraband Parakeet’s and other’s share the above ground space in the aviary. A parakeet is any one of a large number of small to medium-sized species of parrot that generally have long tail feathers. Parakeets in the aviary are primarily native to Australia. The smaller parakeets are also known as budgies. Only one parakeet/parrot, Mei-Mei (pronounced May-May) is not found native to Australia. She is actually a Monk Parakeet, also known as the Quaker parrot. She is a small, bright-green parrot with a greyish breast and greenish-yellow abdomen. Quaker parrot/parakeet’s originate from the temperate to subtropical areas of Argentina and the surrounding countries in South America. She was donated to the aviary by an Alpine family about 4-years ago. Mei-Mei prefers to remain in the enclosed shed area of the aviary. Several local house sparrows or barn finches live in the aviary. 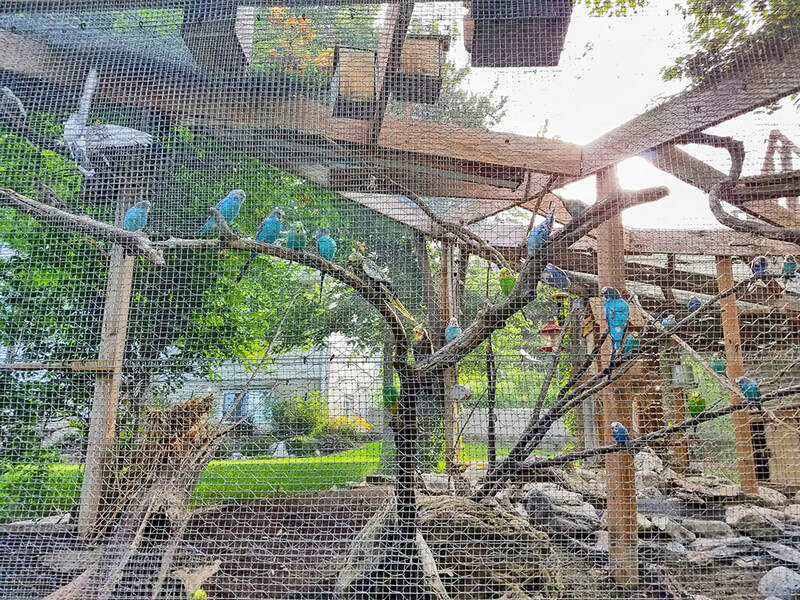 Their existence in the aviary is was a result of early years, where a parakeet would escape the aviary and attempts to lure the bird back into the aviary would result in some of the local dwelling residents being introduced at the same time. The current wild birds are actually 3rd and 4th generation and were hatched within the aviary. The birds are acclimated to Utah and do fine in the hot Utah summers and very cold Utah winters. They struggle if they get wet during cold weather and are not able to dry-off. A simple heat lamp remains on during the coldest days of winter to make the drying of their feathers possible (after getting wet). The lamp is not intended to keep them warm as they do fine in the cold weather. They do not appreciate strong windy weather and the shed also provides a respite from the wind. The newer addition of the aviary is the South portion of the aviary. It houses a few of the “Shy” species. Canaries, Zebra Finches and a few species of Quail. These are kept out of view of the main trail and public to prevent the birds from being stressed or spooked and flying into the structure, resulting in injury or death. Almost all species of Hawks found in Utah eventually seem to find their way to the aviary and will typically spend a day or two flying back and forth in attempts to catch the birds. Older birds in the aviary tend to simply fly inside the shed or will remain out and ignore the hawks. However, newly introduced birds will easily spook and have occasionally flown into the wooden structure, resulting most often in the bird’s death. So, while the hawks do not catch the birds, they still have potential to cause injury. Young hawks have been observed to remain for weeks near the aviary. Those walking the trail in the early morning hours are most likely to catch a glimpse of these hawks if they will look to the tops of the adjacent trees, as the hawks fly to nearby treetops when people walk on the trails. Most often, the hawks simply return to the aviary when the people are gone. Bird seed is provided within the aviary and the birds get plenty of balanced seed in their diets. They seem to be very fond of corn tortilla chips (almost any popular brand seems pleasing). When broken into small pieces, the birds will quickly fly to the wire to eat from the hands of those providing these treats. Water is provided in plastic ponds that are filled every few days in the summer. Heaters are used in the winter to keep the pond’s free of ice. Rain, snow and sprinklers will usually keep the ponds topped of during long hot spells of summer, again when needed, gray water is added.